German artist Gerhard Richter, as he’s deep in the throes of creation early on in Corinna Belz’s Gerhard Richter Painting, considers the results of two paintings he’s working on and admits to the camera that he had something different planned than what has resulted so far. For him, he says, his paintings “do what they want.” Richter’s art has often relied on chance and momentary inspiration in the creation of his more abstract works, and Belz seems to have drawn upon that approach in taking on the articulate yet rather cagey Richter as her subject in this film. The end results are mixed but nevertheless scintillating and provocative enough to be worth taking seriously. The most mesmerizing moments in the film are the ones where Belz simply observes Richter at work in his studio in Cologne: mixing paints; wielding brushes and squeegees; applying tones and colors seemingly at his whims; thinking out his next moves; and standing back and contemplating the results, trying to decide whether they are to his liking or not. (Belz captures these scenes with a mixture of stationary wide shots and intuitive handheld camerawork.) A whole host of tantalizing questions suggest themselves as we eavesdrop on Richter while he’s in his creative zone: What is going on in Richter’s head at any given moment? How much of this is planned, and how much improvised on the spot? Richter doesn’t definitively say and Belz doesn’t necessarily pursue the matter. Like Richter’s abstract canvases, Belz daringly turns the process of artistic creation into an act of abstraction; what it reveals about the artist himself, if anything, is entirely up to the viewer to determine. It’s a conceptually fascinating approach that Belz isn’t willing to completely commit to, in her desire to come up with as full a portrait of Richter the man as possible. 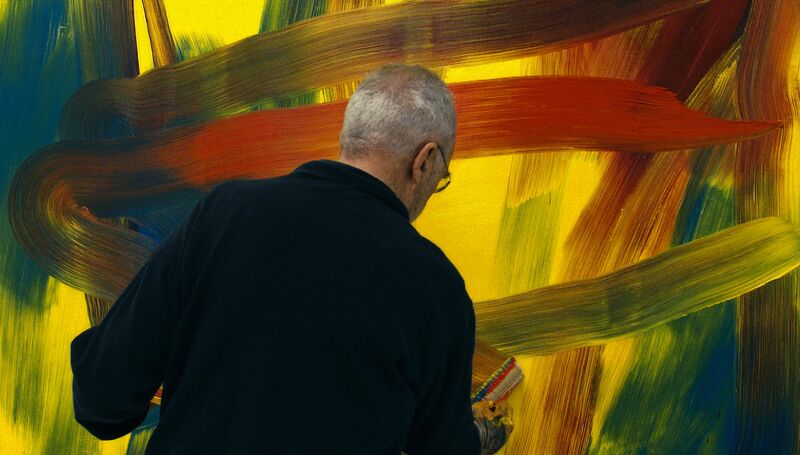 Thus, Gerhard Richter Painting includes more conventional documentary elements: candid interviews, footage of him in public, archival historical footage of Richter in his younger days. Some of these are decidedly less illuminating, if still necessary for contextual purposes. Belz includes scenes of Richter dealing, often reluctantly, with being the center of attention and the object of mass adulation; no surprise that he generally prefers the privacy of his own art studio as well as his one-on-one interactions with art exhibitors and curators. The director, whose voice we hear throughout the film asking questions, also gets Richter to open up a bit about his past—the circumstances, for instance, which led to him to abandon his parents in 1961, a few months before the Berlin Wall began construction, and defect to West Germany and pursue his art at Düsseldorf. The reminiscences clearly make him feel uncomfortable (he never saw his parents again, after all), but then, throughout Gerhard Richter Painting, whenever he isn’t creating or talking about his art, he almost always comes off as shy and reserved (knowingly so, as he suggests in a joke he makes toward the end of the film comparing polite German museum-goers compared to more brutally honest American ones). It’s his cageyness that leads to the film’s most intriguing scene, in which Richter, while he’s working, momentarily turns on Belz and voices his skepticism about this whole enterprise. “I don’t think I can do this painting under observation,” he says to her; a moment later, he fleshes out his complaint by saying that, among other things, he feels like he works and moves differently when he knows a camera is constantly on him (for instance, he says he “shuffles [his] feet” differently while walking). This is arguably the key scene of this film; the implications of this moment even cast a pall on the moments elsewhere in the film where Richter fumbles about to try to come up with verbal explanations for his own work (he admits he’s better at articulating his own art in writing than in person).